Paint colours help to create a beautiful, welcoming and relaxing bathroom for your home. You can even get that feeling of being at the spa right in your own home, by choosing the paint colours and accessorizing with a focal wall in a different colour or paint the ceiling a shade darker than the rest of the room. Add bold coloured accessories and of course the perfect lighting. Here are a few tips on what you need to do before you start painting the bathroom. 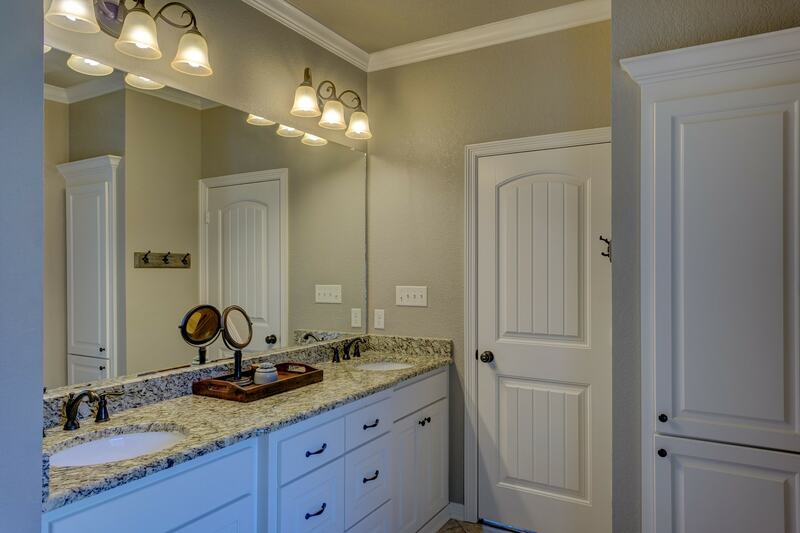 If you are painting the entire bathroom you won’t need as much paint as larger rooms in your house. But you do need to make a couple of choices. Because the bathroom is a high moisture area from the hot water steam from showers or baths the best paint finish and sheen to select here would be a semi-gloss paint for the walls. Semi Gloss Paint can withstand the acccumlation of moisture better than the other paint finishes as well it is tough enough to withstand frequent clean ups and is mildew and stain resistant. Semi Gloss Paint is recommended for painting the bathroom. To get a spa like feeling when painting the bathroom you can choose any one of the neutral paint tones available from paint manufacturers. You can see their paint products and select your colour online or have the painter show you the paint chip samples when you’ve scheduled your interior house painting project. Painting a Bathroom in Neutral Paint Colours gives you a calming spa like room in your house. In order to prepare the room to be painted by yourself or if you’ve hired a professional painter you need to follow just a few steps. Remove anything from the room that you do not want painted. You or the painters should cover the floor with drop cloths to ensure protection to the flooring. You can use painter’s tape around the edges of the baseboards to ensure straight paint lines. Using a scraper remove the old paint and clean the debris with a dry paint brush or vacuum. Prime the walls, baseboards, trim and ceiling with a primer painter before you start painting the walls. Now that you know what needs to be done when painting the bathroom on your own or if you choose to hire a professional painting company. With over 30 years of being in the painting business PG PAINT & DESIGN in Ottawa is here to help you get that look your looking for in any room of your house, condo, apartment or home. View our photos gallery to get your next house painting inspiration. Choosing a paint colour for painting the bathroom in your house is not as hard as some might think. Your Ottawa house painters PG PAINT & DESIGN can help with a paint colour consultation or you can visit your local paint store in an Ottawa neighborhood near you.